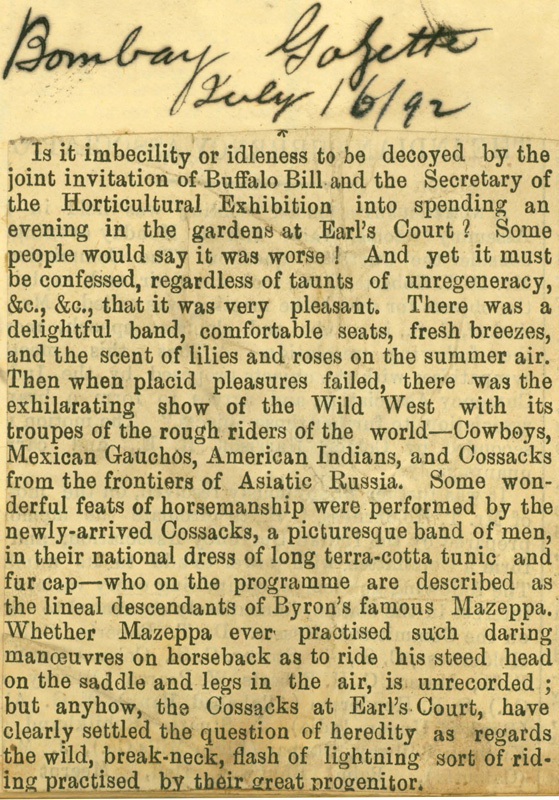 Is it imbecility or idleness to be decoyed by the joint invitation of Buffalo Bill and the Secretary of the Horticultural Exhibition into spending an evening in the gardens at Earl's Court? Some people would say it was worse! And yet it must be confessed, regardless of taunts of unregeneracy, &c., &c., that it was very pleasant. There was a delightful band, comfortable seats, fresh breezes, and the scent of lilies and roses on the summer air. 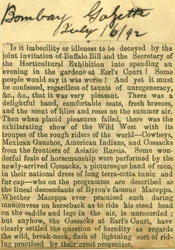 Then when placid pleasures failed, there was the exhilarating show of the Wild West with its troupes of the rough riders of the world—Cowboys, Mexican Gauchos, American Indians, and Cossacks from the frontiers of Asiatic Russia. Some wonderful feats of horsemanship were performed by the newly-arrived Cossacks, a picturesque band of men, in their national dress of long terra-cotta tunic and fur cap—who on the programme are described as the lineal descendants of Byron's famous Mazeppa. Whether Mazeppa ever practised such daring manuvres on horseback as to ride his steed head on the saddle and legs in the air, is unrecorded; but anyhow, the Cossacks at Earl's Court, have clearly settled the question of heredity as regards the wild, break-neck, flash of lightning sort of riding practised by their great progenitor.